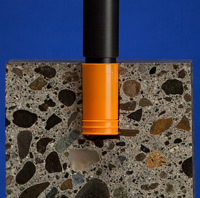 As RH in situ methodology gained technical traction at the turn of this century, relative humidity (RH) testing came to be adopted as a valid means of accurately indicating moisture content levels at various locations within concrete slabs. As the world changes, so too does the world of regulation. The American Society for Testing and Materials (ASTM) standard F2170-11 incorporated several changes to its previous version (ASTM F2170-9) and even with the recent changes, the Rapid RH® 4.0 EX from Wagner Meters is once again in full compliance for accurate and industry-accepted results. F2170 is ASTM’s standard relating to concrete moisture test protocol using relative humidity (RH) as the mode of measure. These changes to the ASTM F2170 standard were intended to ensure the necessary depth-specific readings for RH testing, and to ensure maximum accuracy for RH test results. Sensor placement: The new standard requirement for the placement of an in situ probe for RH testing is that the distance from the sensor to the bottom of the test hole (at 40% of slab depth for slabs drying from one side) cannot exceed ⅝”. Fins for the test hole sleeve or liner: Fin design at the outside bottom of the test hole sleeve helps to isolate the sensor from air traveling down the exterior of the liner, and localizes the area from which the in situ probe will take its reading. Solid sleeve liner design: To minimize interference with the RH readings, test hole liners or sleeves can no longer allow air to pass through them at any point above the sensor. Sleeve liner length: The newly-fitted F2170 standard explicitly calls for in situ probe sleeves to extend from the top to the bottom of the hole. For many RH test methods, standard test liners are adequate for 4” slabs, but any variance on the slab depth can create complications in fully complying with the required standard. Relative humidity test practitioners measure concrete moisture content levels at 40 percent slab depth for a concrete slab drying from one side only. This depth has been proven to most accurately represent the final RH level, throughout the slab, if the slab were to be sealed at that point in time. However, 40 percent depth will vary from slab to slab, depending on total slab thickness, so the ASTM F2170 revision recognizes both the importance of a precise, depth-specific RH measurement within the slab and the need for the sleeve to appropriately isolate the sensor from any other spaces within the test hole, ensuring the RH results are only coming from the 40% depth. In effect, this ASTM revision solidifies that sleeve design, rather than concrete moisture content levels, may exert unintended influence on RH test results. While these may seem like minor changes, the American Society for Testing and Materials has recognized how such a minor technicality could exert undue influence on a concrete moisture test result. Manufacturers like Wagner Meters have always recognized the same vital information, and have provided a solution which ensures that installers, inspectors and flooring experts can fully comply with the latest industry requirements. It is worth noting that the Rapid RH® from Wagner Meters met 3 of these 4 requirements from its initial design. The Rapid RH® Smart Sensor design sets the required distance from the sensor to the bottom of the test hole automatically and immediately when inserted according to directions. The Rapid RH® Smart Sensor also features a solid sleeve design with fins to seal the sensor from external infringement on the sensor reading. Wagner was among the first to address the full-depth sleeve liner requirement. Wagner Meters created “stackable” sleeve units to fit the depth of the in-situ moisture measurement test hole. The new sleeve design by Wagner Meters allows builders and contractors to continue RH testing as they have done in the past. 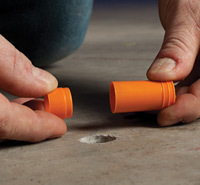 The difference is that installers can build sleeve length by stacking individual units to fit the entire hole depth. In this way, contractors simply use the adapted sleeve design to continue meeting F2170 compliance standards. It has become understood that liners are just as crucial as the sensors for conducting thorough and accurate in-situ moisture content testing. They help to isolate the sensors within from the surrounding slab moisture along the length of the test hole, which could skew moisture content readings and limits the sensor’s measurement to the appropriate 40% depth. The latest development of ASTM F2170 is the result of that shift in RH methodology. And, as always, Rapid RH® 4.0 EX is fully in step for complete confidence and ASTM compliance.